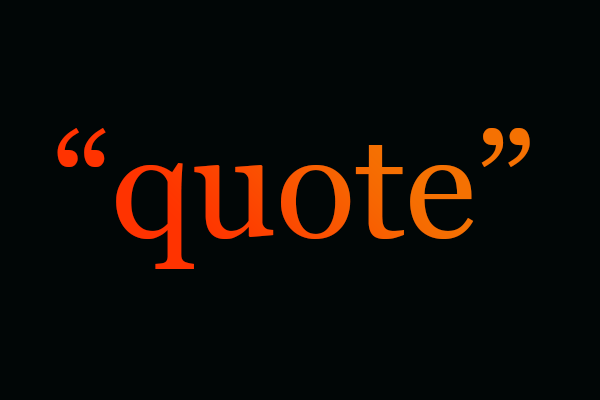 As it’s been some time since I last submitted for your amusement various illustrious quotes, I thought I’d showcase the seventh in a series of various worth-remembering “sayings” which I find interesting and inspiring, and, hopefully, you will, too. Mostly excerpted from the newsletter “Smart Brief” from the American Advertising Federation, these quotes are usually from a member of the Advertising Hall of Fame but not all. 61. All of us who professionally use the mass media are the shapers of society. We can vulgarize that society. We can brutalize it. Or we can help lift it onto a higher level. 62. Plan the sale when you plan the ad. 63. When a client comes to us with a product, he is, in effect, giving us a problem to be solved. … Some of the biggest advertising mistakes are people who imagine they know what the problem is, or they’re not even thinking about; they’re just coming up with that brilliant idea and trying to force the problem to fit it. 65. Ever tried. Ever failed. No matter. Try again. Fail again. Fail better. 66. The agency’s account executive should be able to step into the sales manager’s shoes if the sales manager drops dead today. 67. I am one who believes that one of the greatest dangers of advertising is not that of misleading people, but that of boring them to death. 68. We simply cannot allow the First Amendment to be legislated away. If we ever compromise, we’ve sold out the industry’s future and made fools of those who shaped its past. 69. A successful man is one who can lay a firm foundation with the bricks others have thrown at him. 70. Nothing comes merely by thinking about it. Got a favorite? Lemme know. To Think, Per Chance To Create. Something to ponder or just day dream about. Seriously. To be read or heard, per chance to be understood. Would the mind go where the soul doth lead? On the edge of reality, solutions await. But, lo, what of even the simple idea? Impactful creative is its nourishment to foster growth. The results can still be compelling. Here’s the fourth in a (for now) five-part series of various worth-remembering quotes which I believe you’ll find interesting and hopefully inspiring. Excerpted from the newsletter “Smart Brief” from the American Advertising Federation, these quotes are usually from a member of the Advertising Hall of Fame. 31. Consumers are statistics. Customers are people. 32. It takes a real storm in the average person’s life to make him realize how much worrying he has done over the squalls. 33. Big ideas are so hard to recognize, so fragile, so easy to kill. Don’t forget that, all of you who don’t have them. 34. I have learned that any fool can write a bad ad, but that it takes a real genius to keep his hands off a good one. 35. Good advertising is written from one person to another. When it is aimed at millions, it rarely moves anyone. 36. The creative process is often a matter of changing ‘What is’ to ‘What if?’ We first observe the status quo and then imagine a status novus. 37. No company that markets products or services to the consumer can remain a leader in its field without a deep-seated commitment to advertising. 38. Remove advertising, disable a person or firm from proclaiming its wares and their merits, and the whole of society and of the economy is transformed. The enemies of advertising are the enemies of freedom. 39. We pay just as dearly for our triumphs as we do for our defeats. Go ahead and fail. But fail with wit, fail with grace, fail with style. A mediocre failure is as insufferable as a mediocre success. 40. Know what the client wants, know what the client needs, and know how to cause the client to want what the client needs. So, which one or ones is/are your favorite(s)? Lemme know. Here’s the third in a multi-part series of various worth-remembering quotes which I believe you’ll find interesting and hopefully inspiring. Excerpted from the newsletter “Smart Brief” from the American Advertising Federation, these quotes are usually from a member of the Advertising Hall of Fame. 21. And I have always believed that advertising has a powerful impact on our society. It not only influences public taste and conduct; it also helps shape society’s values. 22. Creativity is no longer about grabbing attention or raising consumer awareness. Its goal is to remind consumers about what is fundamental and gratifying about a brand. 23. Nothing splendid has ever been achieved except by those who dared believe that something inside of them was superior to circumstance. 24. There is no such thing as a mass mind. The mass audience is made up of individuals, and good advertising is written always from one person to another. When it is aimed at millions, it rarely moves anyone. 25. Advertising is a non-moral force, like electricity, which not only illuminates but electrocutes. Its worth to civilization depends upon how it is used. 26. Creativity is so delicate a flower that praise tends to make it bloom while discouragement often nips it at the bud. 27. An idea can turn to dust or magic, depending on the talent that rubs against it. 28. Rules are for people who don’t know what to do. 29. There is not some absolutely revolutionary model that somehow produces the best work. The core principle is still a battle between what’s relevant and what’s not. 30. When we are too timid to risk failure, we reduce the opportunities to succeed. And we eliminate the chance to learn. Here’s another in a multi-part series of various worth-remembering quotes which I believe you’ll find interesting and hopefully inspiring. Excerpted from the newsletter “Smart Brief” from the American Advertising Federation, these quotes are usually from a member of the Advertising Hall of Fame. Get ready to chuckle, and, I hope, remember. 11. Know what the client wants, know what the client needs, and know how to cause the client to want what the client needs. 12. The good ideas are all hammered out in agony by individuals, not spewed out by groups. 13. The three ingredients of effective advertising are relevance, originality and impact, the initials of which spell out what clients most desire: ROI. 14. Anyone who thinks that people can be fooled or pushed around has an inaccurate and pretty low estimate of people — and he won’t do very well in advertising. 15. Creativity varies inversely with the number of cooks involved in the broth. 16. When you are through changing, you are through. 17. There are two kinds of men who don’t amount to much: those who can’t do what they are told and those who can do nothing else. 18. You must make the product interesting, not just make the ad different. And that’s what too many of the copywriters in the U.S. today don’t yet understand. 19. Advertising is the ability to sense, interpret … to put the very heart throbs of a business into type, paper and ink. 20. An important idea not communicated persuasively is like having no idea at all. GE’s attempt to “creaturefy” scary ideas – not bad! Ideas can scare the hell out of people. They can denote change if they’re adopted. Too many times we’re not even given the time to explore generating new ideas. Yet, we seem to be constantly trying to evolve and innovate. Hmmmm, last time I checked, one needed ideas to do that. At least one. This is the third in a series of four related blog posts I referenced in my recent presentation to the AAF Rio Grande Valley. It pertains to ideas and how people react to them. It’s not always receptive especially since ideas are not always welcome. Hats of to GE for this innovative commercial about ideas and their surprising effects on people. It’s actually been airing since 2014 but I just noticed it a few months ago, and again recently. Good for them to continue the campaign. The first time I saw it, I really wasn’t sure what I was watching. The more I watched, the more intrigued I got. It still “gets” me in an unnerving kind of way. Several times I just wanted to go “yuck” to myself, but then felt guilty about wanting to do so. For those who haven’t seen it or who might have missed it, here’s what a scary idea could look like. Next time you come across one, you might give it a bit more respect than one normally would.